Getting access to private land for deer hunting is pretty rare without a lease or some connection to the land owner. These days you certainly can’t blame someone for turning hunters down. Land owners are frequently holding the property for friends or relatives to hunt and don’t want a complete stranger to walk off with a trophy. If you can’t afford to buy or lease your own hunting property, setting up on public lands is probably your only choice. The good news is most states set aside large parcels of land for public hunting. The bad news is the properties are often overloaded with fellow hunters looking for similar opportunities. Battling crowds is certainly not something to look forward to, but doing some homework ahead of time can help deliver a quality hunting experience in just about any tract of public land. Go where other hunters won’t go and you’ll find solitude and deer. Looking for sign is natural for deer hunters, but in this case look for human sign and keep moving until you can’t find it. Most hunters won’t go further than a quarter mile away from the parking lot. Many of them think they are going in much further than they actually are. Do some walking around during the summer months and truly get to know the land and actual distances. 500 extra steps will most likely put you in places that other hunters won’t go. One caveat to this strategy is carrying a deer out. Be prepared for a longer drag. 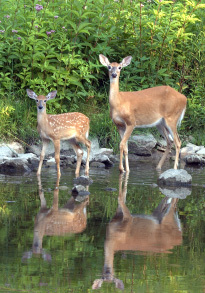 Many public hunting areas have rivers or streams flowing through them. Often times hunters stay on the road side of these obstacles simply because they lack gear to cross water. A pair of hip waders will get you through many of these streams and into a public hunting area that feels like private land. Briar patches, thick regrowth in clear-cut areas, and even steep terrain can also keep most hunters out of a given area. Simply wearing rugged clothing such as chaps and being in good physical condition can put you in position to hunt trophy deer on public land. Crossing barriers may require you to leave the stand in the truck, so be prepared to hunt from ground level. Google Maps, Yahoo Maps, and Mapquest offer excellent satellite imagery for free. TerraServer also offers free map viewing with enhanced options for a fee. Zoom in on a potential hunting property and look for out of the way places deer and hardworking hunters can find privacy. I am astounded at ponds, streams, and even trails that can be found using these maps. There are countless situations in which these free maps have led to incredible hunts. Web based scouting exposes land features you may not have noticed before. Most hunters naturally hit the big woods while ignoring smaller tracts of timber. It doesn’t take long for deer to notice this as well. Hunting small islands of woods can often be more productive than hitting larger sections of forest due to less pressure. Hunting public land can be incredibly frustrating. You are at the mercy of other hunters who often act without regard to your plans. Sometimes purposely, most of the time accidentally. Putting in extra work to get away from the crowds can pay huge dividends.